Encouraging and supporting this sort of fusion is our Twin Rocks passion! Georgiana Kennedy Simpson of Twin Rocks Trading Post of Bluff, UT describes this Navajo Concho Belt. Geogiana (Jana) Simpson knows her stuff. Her dad, about to turn 100 years old, is a trader who is still going strong in Gallup, NM., where Jana grew up. Like the Navajo artists, she learned her trade while she was growing up. Thank you, Jana, for beinging so many innovations to Twin Rocks, and recognizing beauty! Baskets are the Province of Women… and a Few Men. 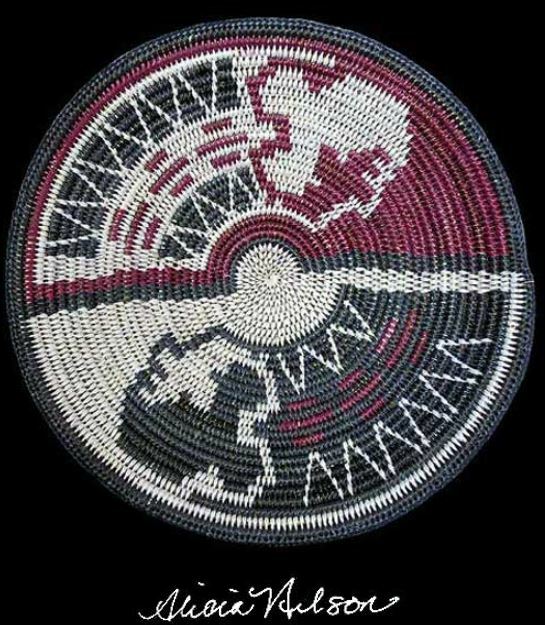 Basketry is generally a woman’s art that is also pursued by the nadle (he-to-she) or men skilled in the arts and lifestyle of both men and women. Basketry is not classified with textile fabrics (yistl’o), but with sewing (nalkhad). Making baskets is a sacred act – many are used for ceremonial purposes. Today, there are several amazing artists at Twin Rocks who have created an art form that is a fusion of tradition and cutting-edge contemporary art. Traditionally, while the basket is in progress, the sewer is untouched and avoided by the members of her family. The basket material, too, is placed beyond the immediate reach of the household. The basketmaking is finished as quickly as possible. Usually, the craft and art is passed down through women in the family, and learned at a young age. In days past, if the basketmaking went on too long, sickness and rheumatic stiffness might affect both the wrists and the joints of the sewer. This was remedied by a singer/medicine man who, in the course of a ceremony, clothed both arms of the patient with the skin of a fawn (bi’yazh). Then, a hole was broken into the south side of the hogan through which the patient extended her hand and wrist. As soon as the wrist appeared on the outside, her younger sister took it between her teeth, pressing them lightly into the skin. This removed the stiffness (nasdo’). There are families of weavers we at Twin Rocks have been honored to work with in their passion to experiment with materials, colors and designs. What they have created is mind-boggling. We believe that creating a new art form is also a sacred act, and we applaud these men and women for their vision! Arches National Park is one of the natural treasures near Twin Rocks. “This is the most beautiful place on earth. “There are many such places. Every man, every woman carries in heart and mind the image of the ideal place, the right place, the one true home, actual or visionary. A houseboat in Kashmir, a view down Atlantic Avenue in Brooklyn, a gray gothic farmhouse two stories high at the end of a red dog road in the Allegheny Mountains, a cabin on the shore of a blue lake in spruce and fir country, a greasy alley near the Hoboken waterfront, or even possibly, for those of a less demanding sensibility, the world to be seen from a comfortable apartment in the tender, velvety smog of Manhattan, Chicago, Paris, Tokyo, Rio or Rome — there’s no limit to the human capacity for the homing sentiment. Theologians, sky pilots, astronauts have even felt the appeal of home calling to them from above, in the cold black outback of interstellar space. The above was written by Edward Abbey, and it is from his book about our red rock country, Desert Solitaire. His use of words is incomparable. The perfect description of how we feel about this, the part of the land we carry in our hearts. The part that grabs travelers as they pass through. 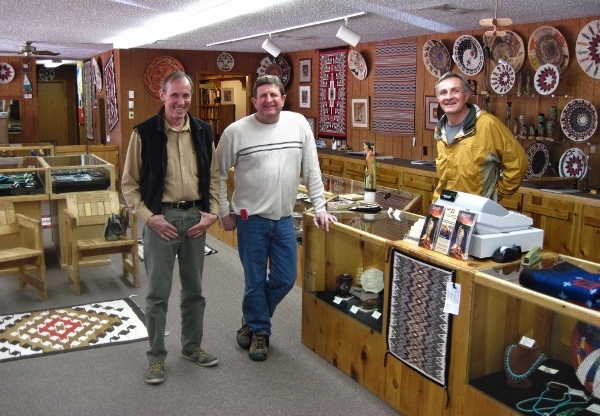 Come to Twin Rocks in Bluff, UT and discover the art that emerges from this magical place. You will be captivated and amazed. But you won’t be surprised. Art that comes from land with this sort of beauty is breathtaking, purely imagined, and the inspiration is clear. 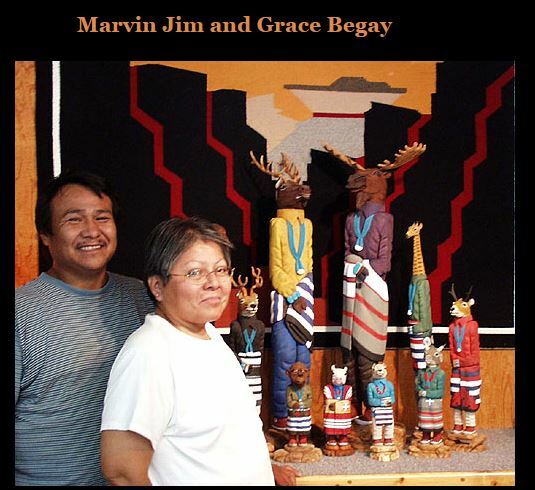 Based upon the Navajo Creation Tales, the extraordinary and unique sculptures of Marvin Jim reflect a time long ago, when animals and humans walked and worked together to create this new world.Traditional Navajo stories speak of conversations among all beings, of behaving in a manner of mutual respect, and of all beings having an equal position in the community. These legends are an essential part of the Navajo culture. The tales are of universal interaction, compassion and tolerance — all the things necessary to live a balanced existence. The animals played prominate roles in these myths. For example, Coyote is often portrayed delivering fire to humans, a selfish act initially, but one that proved selfless in the end. There was Turkey who kept his wits about him during the great flood. When everyone else grabbed personal possessions, Turkey gathered life-giving seeds. These seeds made it possible for the people to survive. The four great rams who dispersed the flood waters into a mirage world, making the earth livable are mentioned. Duck, who dove back into the troubled waters to fetch the forgotten medicine bag of First Man is also an important part of the stories. This act cost him his beautiful plumage, but gave rise to the sacred mountains which guard and protect the people. Marvin has chosen to recreate these lessons through sculpture. Raised in the traditional Navajo way, this talented young artist, carves his “upright animals” to show that there was once, and will be again, a personal connection to the animal world. There is a special grace and love in his work that make you feel happy. Isn’t that a miraculous thing?